Seminar with Martha Feldman on Live coding » Triple E.D. 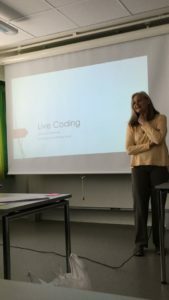 Today we had a extremely interesting and well attended workshop together with Professor Martha Feldman on the art of live coding, and how it may aid us in the discoveries of new and interesting things – rather than putting things into predefined boxes. I believe I can speak for everyone that there was some excitement involved in terms of trying out the ideas on one´s own data. Personally I was so excited about the workshop that I forgot to take a picture, and therefore had to resort to stealing Jonny Holmströms..
Next stop is to try to use the method to find some clues about boredom and the use of routines.. This entry was posted in Guests, Qualitative methods, Workshop. Bookmark the permalink.